D a n c e s W i t h W o o l: Mom, would you knit with me? Mom, would you knit with me? I have been knitting for years mostly alone, there have been just a few but so precious moments when I have had knitting company. Now that I really had knitting companion in the house I was more or less ignoring the fact and was feeding my sewing machine with lovely and colorful fabrics until this above mentioned evening. I took a deep quick dive into my stash and soonest cast on for a new sweater, the most simple raglan with numbers from the top of my head to be able to sit with her knitting. And thus started new era in my knitting life. I was planning on taking a long break from knitting to be able to bond with the sewing but my break was cut a bit short and am not complaining, this small repetitive motion is welcome in the midst of fabric frenzy that always ends up being messy. I left off knitting by casting off the black shawl and the Twined Noro Mittens and I have not yet shown you the black shawl blocked. I did take some pictures of the black beauty but most of the pictures did not turn out quite the way I envisioned so I will need to take a new set of pictures, but here is a little peek. And here is the new sweater on the needles. I am calling her Petite Fleur. My lake is almost free of ice. The chirping of birds is overwhelming. The light, as I have so often said here, is pure magic in May. The trees are yet naked and the grass is not yet green, so there is very little to soak up the light and it is everywhere. The long winter is long gone, it is time to inhale clean spring country air and let the mind wander. Happy Mothers' Day to you all... dear children! I can't wait until my daughters are old enough to share knitting moments with my mother and me! I enjoy keeping up with your projects. What a wonderful story - Happy Mother's Day!! I have had the pleasure of sharing knitting joys with my dau. (cottonhollow on Ravelry) for quite a few years now, despite her being only nearly-11 years old. Such a pleasant time together. So nice to hear from you again, Lene! The tone of this post is so beautiful... 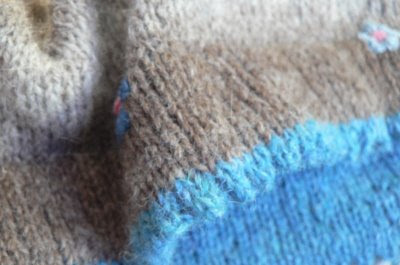 Thank you for showing us some magic knitting again! That black shawl looks so luxurious. Happy Mother's Day to you, dear Lene! The new banner is such a visual treat. 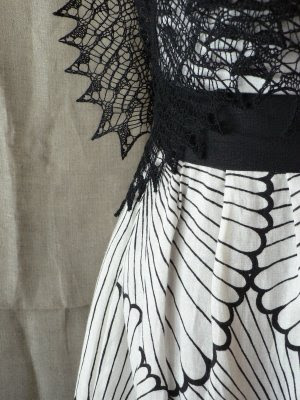 The Black Beauty of a shawl is gorgeous and I love the play of the pattern with the fabric of the dress. The sweater.. I spotted the tiny flowers right off, so was delighted to see the name you gave it. Such pretty colours. I always love reading your descriptions of ... your neck of the woods and the seasons. So good to hear from you again! I know many others look forward to your posts as much as I do. Hope you are having a wonderful Mother's Day; what a joy to have a daughter who can knit with you! Am looking forward to seeing the shawl pictures! PS The new banner is charming and welcoming! It's lovely to hear your voice again and hear that you are enjoying the season, your place, your family. My six year old daughter recently started knitting with me. She doesn't have much of an attention span for it but I think she recognises that this is a good way to get mommy to spend time with her. I really like those special moments. Happy Mother's day! A post from you is a great Mother's Day treat for me. Thank you for sharing your pictures and projects. awww... This post made me cry for some reason. Its lovely, the time spent between mothers and daughters. On a more general note, I love your posts, they are beautiful and thoughtful. Thanks for writing today! that is so great! I have been trying to teach my mother to knit, but she doesn't find it as relaxing and interesting as I do. Ah well, I guess it skipped a generation. That Petit fleur sweater is looking gorgeous! herkkä ja kaunis blogisivu. Viehättävä väritys. Vaihtelu virkistää, mutta tämä on niiiiin hyvä. Ja tosi mukava, helpottavakin, nähdä ja lukea sinun taas kirjoittavan ja kutovan. Olen ollut ihmeissäni hieman. Wonderful to hear from you Lene. I am looking forward to sharing the knitting experience with my grandaughters. The spirit of your life touches me each time I read one of your posts. Such a wonderful way of observing and describing the rhythm of life. Ah, Lene -- every time I read your notes/post, I feel like I'm having a visit with a dear, gentle, talented and treasured friend. I'm so glad you took the detour to sit and knit with your daughter - as these are the memories you both shall keep dear in your heart. The threads that connect women thru the generations are made of such as this. Ah lovely! A daughter to knit with. You are a good mother to heed her call. Welcome back....you have been much missed. What a lovely memory to share with your daughter. It is the little things, the ordinary stuff of life that children remember most. A deeply happy soul just savored this post. It is good. I look forward to my daughter knitting with me someday. What a lovely post! I look forward to knitting with my daughters. We had snow yesterday and I wish spring would be here. I also find that a sunproof blind helps getting to sleep when the sun just doesn't want to go to bed. Oh, my god! Isn't that the best Mother's Day gift anyone can get??? It is so god to have you back, I missed your notes (and pictures)! Lene, I am sharing an award with you on my blog if you'd care to come pick it up. I've been absent for so long and I have missed you and your blog! What a joy to have your daughter request your company to knit. It touches my heart.